The temporomandibular joint (TMJ) has a substantial influence on the occlusion (bite). Problems with the TMJ may be due to: developmental factors, fractures, chronic inflammation or luxation. Trauma seems to be the most common cause of TMJ problems in our clinical case experience. Dr. Kressin typically evaluates the TMJ with dental radiography however, he may also use general radiography with large patients or CT imaging. CT imaging has recently been shown to be most favorable for accurate diagnosis of TMJ problems. For difficult cases, Dr. Kressin works with a veterinary radiologist to establish the diagnosis. The great news is that the cost of CT imaging has been reduced. The Animal Emergency Center and Specialty Services in Milwaukee have both CT and MRI machines on site. Our high case volume of oral and dental problems allows frequent use of CT imaging and specialty radiology services. This case volume provides greater effieciency, and lower overall cost for pet owners. This is the reason many family veterinarians refer pets to us, and work with us in a team effort. What can you expect with TMJ problems? The duration of the TMJ injury heavily influences the prognosis. Our best recommendation is to get the diagnosis early. Waiting, watching and hoping for the problem to go away is unlikely to happen. Many TMJ problems get worse with time. It is always best to establish the diagnosis and treatment plan early for optimal results. If trauma results in a TMJ fracture, TMJ ankylosis may develop. The jaw may lock in a closed position, or there may be a limited TMJ range of motion, making eating very difficult. Difficulty with eating makes for unhappy and unhealthy pets. The TMJ is a "hinge joint". The mandible essentially pivots between the open and closed positions from the TMJ. The condyloid process on the back of the mandible articulates with the temporal bone at the mandibular fossa. If the hinge joint has problems, the occlusion, and opening/closing of the mouth may be affected. Have a look at the normal TMJ anatomy! dowel-like protrusions on each side. mandibular fossa of the temporal bone. 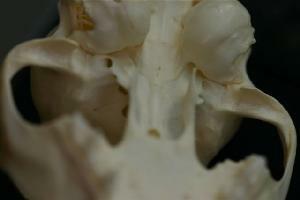 Similar view of the TMJ as the one above. What clinical problems do we see with TMJ in pets? range of motion months after head trauma. 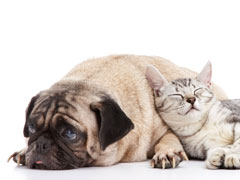 Pets having TMJ problems typically have obvious difficulties, rather than subtle ones. They are often very upset because the mouth may lock into an open or closed position. The consequences of mouth locking can be life threatening. The two radiographs above represent bilateral "subluxation" of the TMJ. The dog would cry out and scratch at the face. TMJ trauma may cause luxation. The pet may appear to have a dropped jaw, and the jaw may fasciculate or tremor. These luxations may be reduced with placement of a pencil between the carnasial teeth and gentle closure of the mouth. Great care is taken to avoid oral or dental injury! If the jaw is unstable and re-luxation occurs, we utilize a tape muzzle or orthodontic appliance to prevent widely opening of the mouth. This stabilization is maintained for one to three weeks. Mouth locked into an open position! Open mouth jaw locking may be due to TMJ luxation or TMJ dysplasia. TMJ luxation is often due to trauma, but can also be due to TMJ dysplasia (or malformation). Open mouth jaw locking may be due to abnormal relationships of the zygomatic arch or the coronoid process of the mandible. These cases fail to resume normal occlusion when attempting reduction of TMJ luxation as described above using a pencil. Typically the Coronoid process can be palpated lateral to the jaw unless it is entrapped near the ventral aspect of the zygomatic arch. Open mouth jaw locking may occur in association with symphyseal laxity, type 2 or type 3 symphyseal separation. 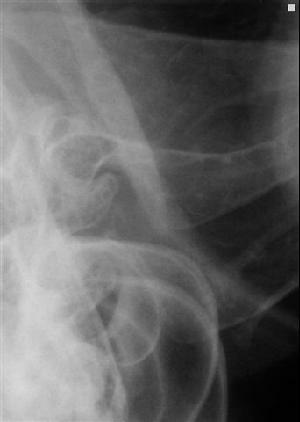 This abnormal symphysis may allow lateral (outward) positioning of the coronoid process, and entrapment lateral to the zygomatic arch. Dr. Kressin has observed one cat with open mouth locking due to dental super-eruption. The upper canine tooth had alveolar osteitis, chronic periodontal disease and it super-erupted or projected into an abnormal position. The upper and lower canines on the same side became entrapped, and the cat was unable to close the mouth. Tooth extraction resolved this open mouth jaw locking. 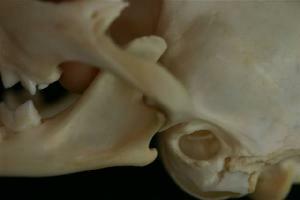 Since the two mandibles are in a fixed position together, luxation of one side affects the opposite side. Right TMJ luxation may result in the coronoid process of the left mandible to "slip" under the zygomatic arch (from the normal medial or inside), and project lateral (on the outside) to the zygomatic arch as shown in the photo below. Open mouth locking from right TMJ luxation. on the side of the zygomatic arch (see above). TMJ luxation would most commonly occur immediately after the mouth opens very wide, as with yawning. 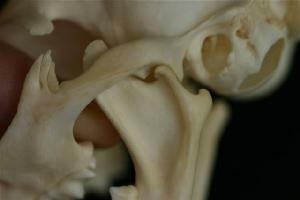 Cat; mandibular condyloid processes. Cat; normal ventral lateral view of TMJ. 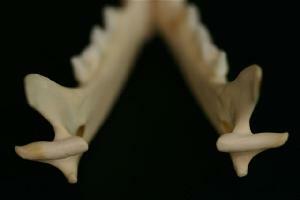 View from behind of the cat's two mandibles joined at the symphysis. This image illustrates why luxation of one side affects the opposite side. Careful manipulation of the luxated TMJ under anesthesia, may resolve the problem as described above using a pencil and gentle leverage forces. Dr. Kressin frequently receives calls from veterinarians stating that animals with TMJ luxation were simple to reduce, but they "re-luxated" nearly immediately after reduction. Consideration of the anatomy is needed to understand the TM joint. The instability of the joint is the cause for reoccurance of luxation. Efforts must be made to provide stability! Orthodontic appliance principles can help acheive stability. These patients are frantic, painful and profusely salivating. When they are anesthetized, the mouth is opened wide and gentle force can be applied to push the coronoid back under and medial to the zygomatic arch. Again, stabalization to avoid wide opening of the mouth is helpful to prevent reoccurance of open mouth jaw locking. 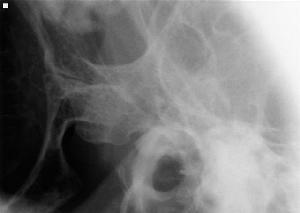 Surgical osteotomy and osteoectomy of the coronoid process, or the zygomatic arch may be needed to prevent locking. Some cases require both procedures depending on the relationship between the coronoid process of the mandible and the zygomatic arch. If both procedures are required, it is technically easiest to treat the coronoid process before the zygomatic arch. The surgical access to the coronoid process entrapped with the zygomatic arch is minimally invasive. Evaluation of the dental radiographs, general radiographs or computed tomography images along with the functional occlusion of the patient will dictate the optimal treatment plan for TMJ fracture. Surgical treatment by condylectomy or mandibulectomy may be required if there is functional impairment of the temporomandibular joint. TMJ ankylosis is a severe life threatening condition. True ankylosis is very difficult to treat due to the intra-articular (within the joint) bony fusion. Exposure of the joint capsule requires manipulation of the large masseter muscle. Extracapsular fibrosis or neoplasia, can limit the TMJ motion and appear as ankylosis. Surgical release of the extracapsular fibrosis, condylectomy, partial or total mandibulectomy, may be required.